This banana cake is full of flavor and topped with a caramelized brown sugar + banana layer that is to die for! This morning I woke up with a hankering for something made with bananas. I always have banana muffins on hand, but i wasn’t in the mood for those. So, I started brainstorming ideas and came up with this! The pineapple upside down cake’s (delicious) step sister. This cake is just glorious. If you are a fan of bananas, you will absolutely LOVE it. The brown sugar and butter on top caramelize beautifully, creating a gooey coating that is to die for! Not to mention, while baking, it oozes up the sides and you can see the scrumptious caramel bubbling, try to contain your excitement. The bananas also caramelize making them deliciously sweet. If I had to choose my top favorite desserts, this one would be on the list. The cake has is very moist with a punch of banana flavor, but not overwhelming at all. I think the best thing about this cake is that if you have bananas, you most likely have everything else in your pantry! It has such simple ingredients but creates such a FANTASTIC result. The cake looks so elegant, yet it only took about 10 minutes to throw together. Nobody will believe that you didn’t spend all day on it. Is there anything better than caramelized bananas covered in caramelized brown sugar + cake? I think not. I mean, I’m not even the biggest banana eater and I still enjoy this cake so much! 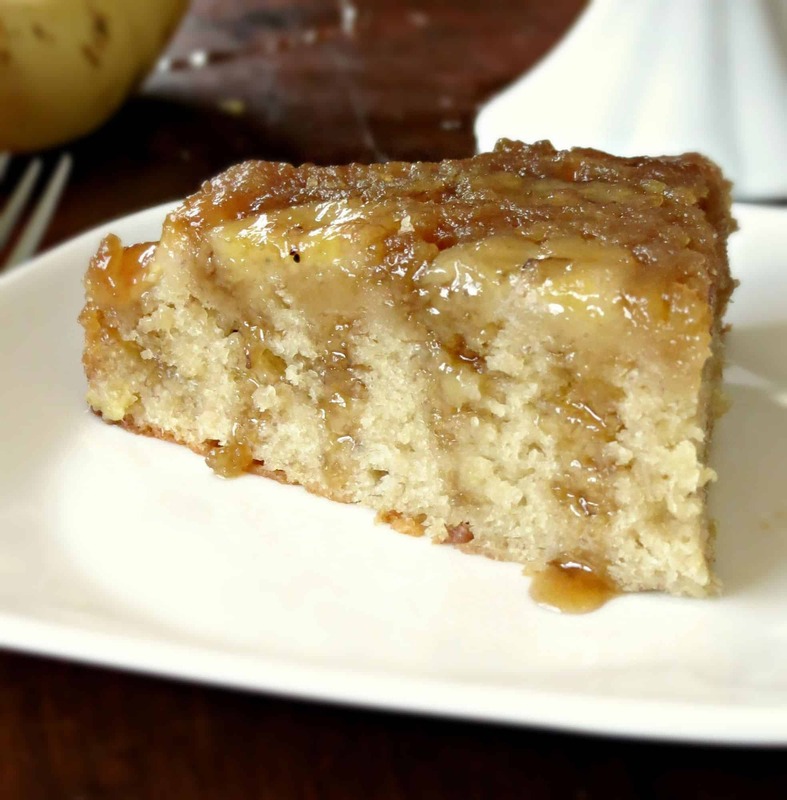 While this cake is the best served warm from the oven, just like banana bread it is just as amazing the next day, too! So, it is definitely okay to make this cake a day in advance without sacrificing taste because it only gets better! It’s also delicious warm with some vanilla ice cream on top! 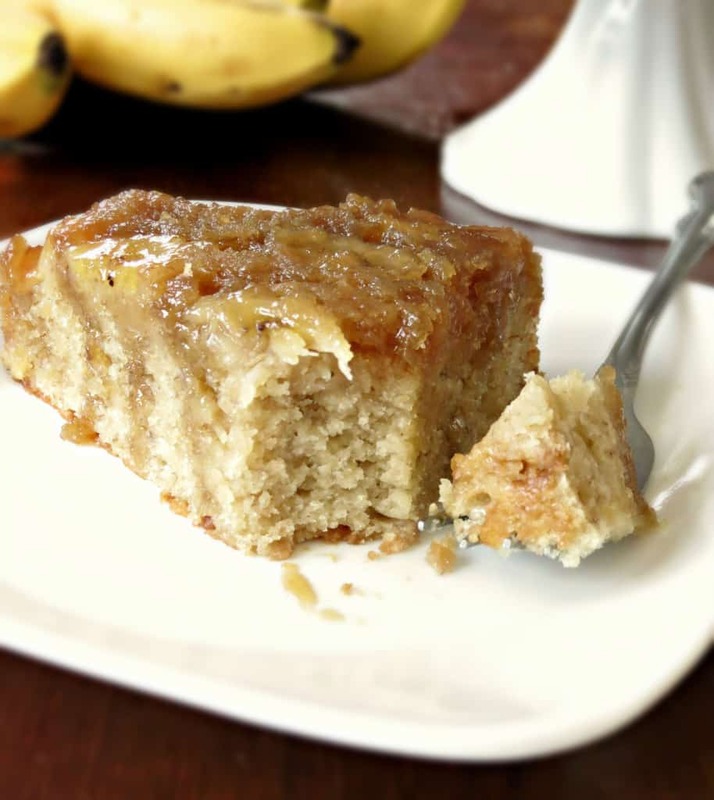 Banana lovers (or not).. you need this cake in your life. Now. Preheat oven to 350°. Grease a 9" round baking pan very well, set aside. In a large bowl, combine all dry ingredients and whisk very well for one minute. Add in the wet ingredients and stir until completely combined and no lumps remain. Don't over mix. Pour cake mixture into prepared pan on top of bananas. It will fill almost to the top of the pan. RECIPE EDITED TO ADD: Based on reader's reviews, it seems some have had the batter spill over while baking, and some have had great success. To prevent this, simply place the cake pan on a baking sheet when it goes into the oven to catch anything that spills over. Bake for 42-47 minutes or until a toothpick inserted in the center comes out with a few moist crumbs. Cake is best served warm out of the oven but will stay moist and fresh for up to 5 days in an airtight container. This cake is able to be made the night before the day needed for consumption. Ha ha, I’m sure you all will LOVE it! It’s even better the next day. A butterscotch sauce sounds awesome to go with this!! Enjoy! How do you store this for the next day. I want to make this a day before thanksgiving. Should i store it in the fridge? Just store it covered at room temp, Ira even better the next day. Enjoy! And have a wonderful Thanksgiving, Elysa! Thank you so much it turned out great!! I wish I knew how to upload a picture. How do you store this? I want to make this a day before thanksgiving. Can i store in the the fridge? How do u make it gluten free? Made this today, I was looking for something to serve to company with basic ingredients so I could make it without a trip to the store. I also wanted a cake that didn’t need frosting as I was pressed for time. Turned out beautifully, and so delicious!! Only change I made was to add a little cinnamon. Thanks for the wonderful recipe! So happy you enjoyed it! Adding cinnamon sounds delicious, I’ll have to try that next time! I dont usually write reviews but i just made this and it is absolutely delicious! I will definitely be making this one of my staple cakes! I also added a little cinnamon my cake is in the oven, for I have a bigger old cake pan it’s between 9 & 10 inches so it was perfect hope it turns out as good as it looks! We’ll see in about another 20 to 25 minutes. Wowzers!! Great recipe and super easy to make! Taste amazing! Followed the recipe to the T except for using 3 ripped bananas, adding 1/2 tsp of cinnamon and about 1/4 cup chopped walnuts! Fabulous! Thanks for sharing!! Yummy! Thanks for the ideas, I’m so glad you loved it Sandra!! What a great perfect little easy recipe. And it’s gorgeous. Cut my bananas on diagonal. Added a little nutmeg and cinnamon. Will make this again…and again. Found this and had to try it – the only change I made was swapping the 1 1/2c flour for 2 cups gluten free flour (Betty Crocker’s, if it matters). OMG. It’s literally the best cake I’ve ever made. I’ve pinned it to my permanent GF recipe list and I can’t wait to bring this to Saturday’s potluck! Yay, thank you! I’m happy you love this cake, it’s one of my favorites! That’s good to know that it comes out great with gluten free flour too! I hope everyone at the potluck enjoys it! I made this and have not tried it yet but am very upset because my 9 inch pie pan overflowed! I used a Wilton 9 inch pie pan and the brown sugar/butter portioned bubbled out from under the cake as it baked and it is now a crisp burnt mess in my oven. Your recipe said it would look like too much batter but don’t worry, so I didn’t…but I should have. Just a warning to others! I’m sorry about the results of your cake, Caroline, but most likely the reason this happened is because you used a pie plate. I’m assuming your pan has slanted sides, correct? That is probably why your cake spilled over because your pan is not deep enough to hold all of the batter which is why I state in the recipe to use a round cake pan, not a pie plate. I have many family members and readers who have made this cake (including myself, over and over again) with no issues so it must have been the pan you used. I hope it still tasted good, though! Was it okay when you cut into it? That’s a great idea. You’re very welcome! I wonder if the Wilton 9 inch pans are a tad smaller in volume. I just made this using the same pan and I, too, have burnt caramel all over the bottom of my oven! No, I didn’t use a pie pan as indicated. I used a Wilton 9 inch layer cake pan. The batter filled the pan completely to the top and I knew I should of taken some out but the recipe stated it would be fine. It wasn’t. I’m not a novice baker, I followed the directions to a T and now I have my work cut out tomorrow getting burnt caramel out of my oven. Very sad! I’m so sorry this happened! The recipe does not state to use a pie pan, you were correct in using a 9″ round cake pan. I’m not sure why this happens to some readers and not others so I’m very sorry about that! I hope you at least enjoyed the cake. Next time, try placing a baking sheet under the baking pan to prevent this, I have included that in the recipe based on other readers’ reviews like yours. Try using a 9 inch cake pan instead. More depth up the sides rather than a pie plate. That’s so great to hear! You’re very welcome! Rarely am I ever able to reproduce a recipe that looks as good (maybe better ) as the original. Thank you for the fabulous recipe. I made it exactly as written and it was perfect. I might fool around with it a bit next time, perhaps an addition of blueberries? This one is a keeper for sure and my house smells incredible! My favorite part about making this cake is the moment you flip it over and it comes out perfect every time! That’s one of the reasons I love this cake so much I’m glad you loved it just as much as we do, Jan! Blueberries sound yummy! Regular milk is fine. Or you can make your own buttermilk by adding 2 tablespoons of white vinegar OR lemon juice to 1/2 cup of milk. I suggest using whole milk because of it’s higher fat content. Hope this helps and I hope I got back to you in time, Sasha! Hello! I make mini pineapple upside down cakes using a cupcake pan, do you think this would work ok in there? When I make the minis the only thing I usually adjust is cook time. I have made this cake once before and it is soooo good! I am wondering if I could double it and bake it in a 9×13 pan?? Hmm, I’m unsure. It might be a little difficult to flip it but if you give it a try, I’d love to hear how it comes out! Hey! I wanted to make mini versions of this (I use a heart shaped cupcake tin) and I was wondering if you think that would work ok and how I should adjust cooking time/temp? This cake baked perfectly in a 10″ round cake pan. I used greased parchment on the bottom which helped turn out the cake. I also added 1 tsp. of cinnamon and 1/4 tsp cloves to the batter because I cannot imagine banana without those spices. Awesome!! Love the added spices. This is one of the yummiest cakes I have ever eaten! Thanks Wendy!! I’m so glad you enjoyed it. Jessica, I baked this cake yesterday and it is beyond fabulous! It turned out perfectly. I only have one question. In the print recipe, it says one tablespoon of vanilla. I’ve never used that much for a cake before, so I changed to one teaspoon. Just wanted to check in with you about it. Yep, that’s correct! But I’m sure lessening it to one teaspoon wouldn’t make a huge difference. So happy you enjoyed the cake!! I made this cake twice already and I have to say it is the most delicious thing I’ve ever eaten. Yes, it did bubble over both times, but I placed some foil underneath the pan so clean-up was a snap. Thank you for sharing this wonderful recipe!! Awesome! I’m not sure why that happens to some and not others.. Glad you remedied it though. HUGE success! The cake was moist, but not gummy like bread pudding, and not on the dry side like banana bread, either. Nice and fluffy with a delectable banana flavor. My husband and my son (and I) loved it. I used a 10″ pan to prevent dripping and it worked wonderful. Thank you so much for sharing this recipe. Next time, cherries alongside the bananas. Awesome! Cherries sound like a relish addition! Sorry for the late response! Yes, that is the best part! As long as you grease the pan very well before, you will have no issues. I hope your dad loved the cake if you made it already! Thanks so much, Rebecca! So glad everyone enjoyed it. Had some overripe bananas.Stumbled upon ur recipe. Made this today. It was super easy. Used only half cup brown sugar for the caramel base. It turned out to be so soft, moist and delicious. Thanks a lot !!! I’d love to see a picture! You can post directly to my ‘Sprinkle Some Sugar’ facebook page or tag me on instagram using the hashtag #sprinklesomesugar! So glad you loved the cake, Jessie! Isn’t the best part about making it flipping it over! Cake turned out delicious was wondering if you can store in fridge? Sure! I usually store it at room temperature though. I’d love to see!! That sounds awesome! Please post a pic on my Facebook page or tag me on instagram!! I will soo be making this again and again. Woo! Ha ha, you are too too funny! So glad you enjoyed the cake, Clarisa! I was so nervous making it but it came out so well! Loveee it! It’ll probably be over by tomorrow itself. I’ll have to make it again soon! Hi. Can this recipe be made in advance and frozen? Woo! Thanks for letting me know, Freda. Have an awesome weekend! I made this cake last night. After about 25 minutes the top was a deep golden brown, so I checked it with a toothpick in three spots because I didn’t want it to burn, but was skeptical about the quick browning. The toothpicks all came out crystal clean, no crumbs, no wet batter, so I took it out of the oven. I followed the cooling instructions, then inverted it onto a plate and it looked like the center sunk when I flipped it out on the plate. I let it cool, but found that it was runny in the center. My oven temperature is accurate. Any ideas? This was so amazingly good! I added some crushed pineapple to the top with the cute up bananas. Thanks so much for this awesome recipe! I have a round 2 quart, deep casserole dish. When I make the banana upside down cake it will be in the casserole dish! Greased and floured, the cake should come out. This is a great recipe. I made it and I loved it, my little ones really like bananas so we keep a surplus in stock I will be using this to rid our house of the over ripe ones they don’t eat. Thank you. This banana cake is THE BOMB! Everyone that tried it, loved it! 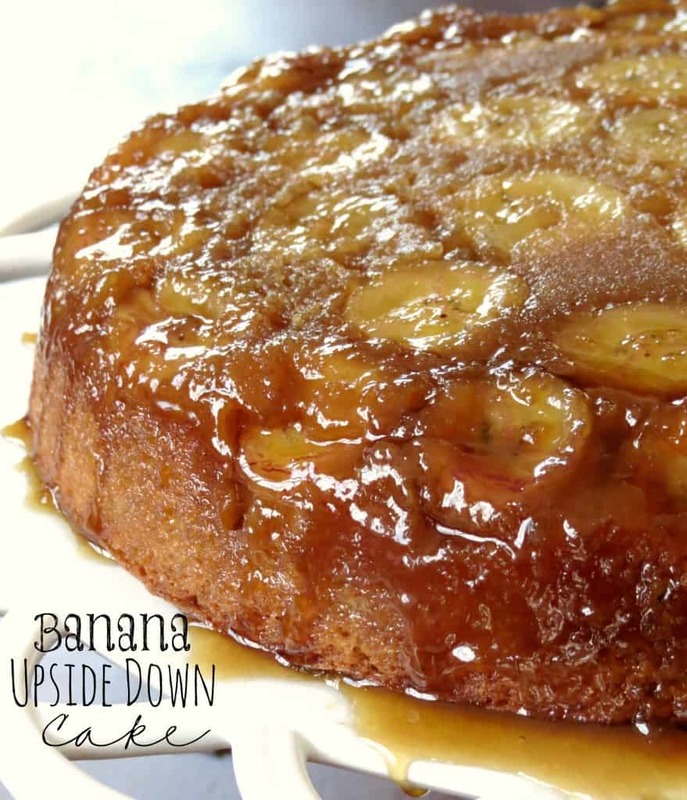 Are there words to describe this banana upside down cake? SHOCKED because I thought it may be too sweet! AMAZED the flavors came together like no other! DELICIOUS, OUTSTANDING, WINNER WINNER! YUMMY MORE PLEASE …….DARN BECAUSE IT WONT LAST LONG! Only advice I could give when baking this SCRUMPTIOUS cake is do it when no one is around so you get more than one piece. Thank goodness it’s so EASY to make! Thank you for sharing this recipe because it’s a KEEPER! Do you think this could be done in a cast iron skillet? I have never tried, but have had readers tell me that they have made this in a cast iron with great success. Just be sure to grease very well! I just made this in my 10 inch cast iron skillet and it turned out great. I used dark brown sugar so mine is a lot darker than the picture. I greased the pan really well with coconut oil and it came out of the pan easily. It did not flow over the pan as others have stated (but I did put a cookie sheet under just in case). Hope this helps. Great idea to make this in a cast iron! Hi, i want to bake this cake for my mum’s birthday and i’d like to know if brown sugar can be replaced with castor sugar. I wanted a 9×13 cake so I did one and one half the recipe. It fits perfectly. I added walnuts for the protein and texture and a bit of pumpkin pie spice because I love it. Sounds like some yummy additions! Reading through the comments, I am shocked that no one said it was too sugary. I even left out the 1/4 white sugar in the batter and was still way too sweet (my bananas were not that ripe either). I feel like cutting the sugar in half would be better and using only half the glaze would be more than enough sugar sweetness in this cake. Love the idea! The cake is nice and moist and I LOVE the carmelization of the top! Adds sooo much flavor. Will use this recipe again with the adjustments to the sweetness. Thanks! Nope! It melts/caramelizes as it bakes. Enjoy!